3.5 stars. I can’t fully bump this up to 4 stars despite the interesting premise and great ending. There’s too much set up here to really consider this one as having a full narrative arc. However, it’s a very promising start to a series and I’d really recommend it if you’re looking for darker young adult fantasy. 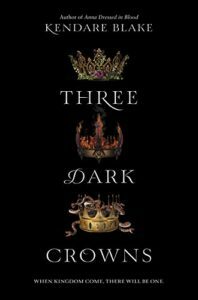 Three Dark Crowns takes place in a world where every generation has a set up triplets born to the queen. These triplets are claimed by different factions and raised by them to help them hopefully win the crown by killing the other two. Poisoners, Naturalists, and Elementals all want their queen to win, but poisoners have been in power for several generations. This time around however, the elemental queen is very talented. She has no problem controlling the elements around her whereas the same cannot be said of her poisoner sister who can’t stomach poison of any kind and her naturalist sister who doesn’t even have a familiar of her own yet. The narration switches from queen to queen and I was surprised by how much I liked each viewpoint. I never really knew who I was rooting for. Actually, that’s a lie. I was definitely rooting for team “sisters refuse to kill each other and band together to rule the kingdom together”. If there was one thing I had a hard time buying into, it’s that a society would actually revolve around this kind of thing, but whatever. Blake is a solid writer. I’d rather she spent a little less time on the romance aspect and focused more on the political intrigue of sister’s murdering each other. A small quibble. The ending was great and I can’t wait to see where this one goes. Share the post "Three murderous sisters"